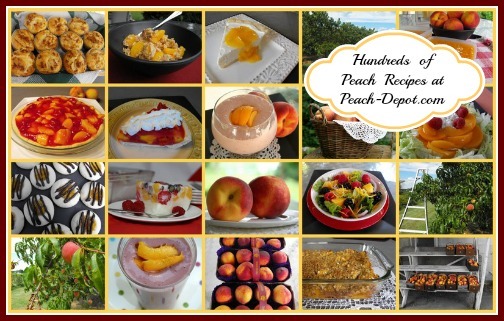 If you are interested in Peach Recipes, here are 100's of recipes with pictures to make easy peach desserts, cobblers, crisps, crumbles, yummy muffins, pies, smoothies, peach preserves, canned peaches and much more! In addition to hundreds of recipes, you will also find information about Growing Peaches, Peach Nutrition and Health Benefits, and General Information about this delectable fruit ... it's all here! A website devoted to EVERYTHING PEACH! Peaches are the tastiest when eaten fresh, a splendid idea for a healthy snack, a fresh salad, or an evening dessert. These fruits can be preserved by freezing peaches or canning peaches to use for future baking into cakes, cookies, tarts, pies, peach cobblers, crisps, crumbles, and more! Everyone knows that peaches make amazing, mouth-watering, jams and jellies! And ... don't forget the scrumptious taste of smoothies, cocktails, punches, and ice cream! Use the navigation bars at the left column (or scroll down for mobile users) for links to hundreds of delicious recipes using peaches. Since peaches are one of my favourite fruits, I have collected a large number of peach recipes that I would like to share with you. Most of these recipes also include a picture of my finished creation ... I know that it is much easier to follow a recipe that has a picture accompanying the instructions. You will find that the recipes in this collection are easy to make, and are made of ingredients that most people will have in their kitchens ... not ingredients that you are not even familiar with! Peaches are one of those irresistible foods; round juicy fruit with "downy like" reddish-yellowish skin that doesn't seem to satisfy my craving taste buds after eating only one! Have you ever grilled peaches or other fruit? Grilling fruit is fun and easy! Instructions for how to grill all types of fruits, and the best grilled fruit recipes are also included within this website. The nutritional value of peaches makes them a desirable addition to any diet. They are a good source of many different vitamins and minerals such as potassium, Vitamin A, Vitamin C.
Eating this fruit also provides the body with a healthy amount of dietary fibre. Not only do they taste so very good...they are also very healthy for you! Growing peaches is a fun and challenging experience for anyone who loves to garden and grow their own fruit. Every tried to grow a tree with a peach pit? If you are unable to grow your own fruit trees, you can still take advantage of "pick your own" farms, and enjoy the experience of picking your own peaches. In fact, you can pick by the basket-full, to harvest enough to freeze or can for use until the next season! Take a look, and I am sure you will agree that including juicy peaches in your diet is a "peachy idea"! I am sure you will find peach recipes and ideas to inspire you to prepare a dish with these scrumptious fruits! Please subscribe to Peach Depot's RSS Feed. It keeps you totally up to date of all newly added peach recipes, (with pictures), growing information and nutritional updates. Or, simply join our Facebook Page! Click the Facebook "Like" button underneath the "Like Us? Love Us!" Box, and receive all updates via your Facebook Homepage. The Peach Blog lets you know whenever new or changed web pages appear on Peach-depot.com website. Peach recipes are constantly being added! Subscribe with an RSS Feed, or, check it out now and see what's new!